When I was a child living in the Bay Area, my parents and I would occasionally take weekend trips to Oakland's Chinatown. That meant only one thing to me: a trip to the Chinese bakeries! One of my favorite items was a jiggly, sticky triangle of sticky rice. It was salty, sweet, and tangy, and I absolutely loved its sticky, chewy texture. Well, that's exactly what this recipe reminds me of. While it wasn't quite as good unfortunately, it was definitely a throwback to my childhood days and a tasty treat nonetheless. These cakes are pretty easy to make, although they do take a bit of elbow grease. You probably have most of the ingredients in your pantry (with the exception of maybe the sticky rice), so the recipe doesn't require anything crazy, exotic, or hard-to-find. Probably the most difficult parts of the recipe are where the mashing and mixing are required. Mashing up cooked sticky rice (with a potato masher) proved to be fun, but a bit exhausting. Once you're ready to mix in the rest of the ingredients...well, be prepared for a good arm workout! This stuff is STICKY! And you want to make sure everything is well incorporated and non-streaky. I'd actually suggest continuing to use the potato masher to mix everything, as it seemed a lot more efficient than switching to a spoon. But in the end, you have an ultra sticky, gooey, gelatinous treat that sticks to your fingers like paste, but is yummy. The actual rice base isn't very salty or sweet, which was a bit surprising since I was sure the soy sauce-brown sugar mixure would be pretty prominent. 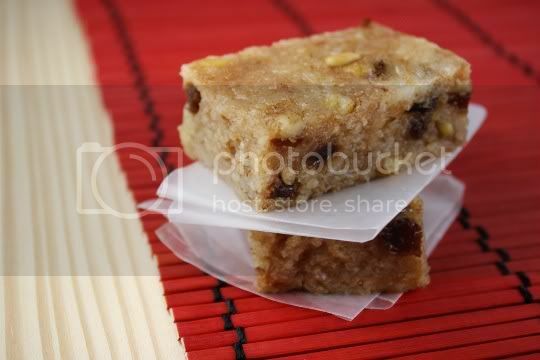 But each bite is chockful of juicy raisins and crunchy nuts (I used walnuts, not chestnuts), and each piece has that fun-to-eat sticky texture. Depending on how big or small you choose to cut the pieces, these cakes could be eaten for either a quick snack or even breakfast. And thanks to all the cinnamon, I'd say they even remind me of cinnamon-walnut-raisin bread...just in a sticky cake form! Make again? Yes...although these are best if eaten immediately! If refrigerated, they get hard and almost inedible (as I had to discover the hard way); if left to sit out too long, they develop a hard crust. I suppose they'd possibly be okay wrapped tightly and kept in an airtight container at room temperature. 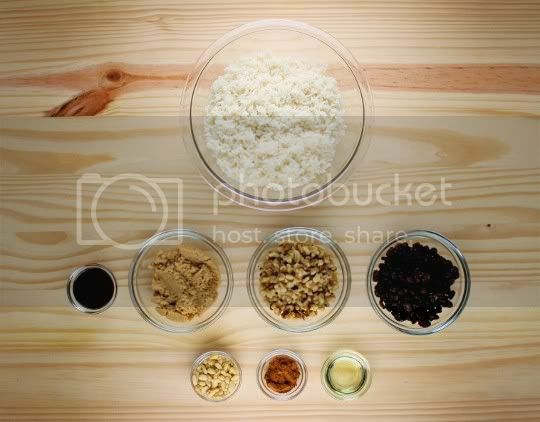 Soak the rice in one quart of cold water in a medium pot overnight. Drain well. Return rice to the pot, and add 2 cups of water. Bring to a boil, then reduce heat and cover. Let the rice simmer until the water is evaporated, about 15 minutes. Remove from the heat. Using a potato masher, mash the rice well. Set aside. Add soy sauce and brown sugar to a small pot. Heat on medium until thick in consistency, about 10 minutes, stirring frequently. Add the soy sauce mixture to the rice and stir well. Add the nuts, raisins, pine nuts, and cinnamon and stir again, making sure all ingredients are thoroughly incorporated (here's where you need some serious arm strength). Spoon the rice mixture into an oiled baking dish. With oiled hands, spread and pat down the mixture about 3/4-inch thick. Cut and serve. These look like they'd be a really good summer treat to bring around to a picnic! That way you won't waste any of them. They look like a really interesting little snack. I was sold at, "Sticky". Yum. These would be great to make and carry around and eat as a snack. The ingredients are on my list. Thanks.